Fall is many people’s favorite season, especially if they live in one of the states known for its beautiful fall foliage… like we do! 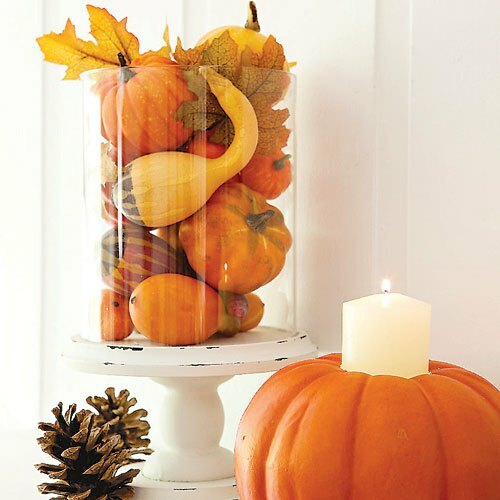 Check out this awesome collection of handful of ways to decorate your home for fall. Natural style – Luckily, the colors of fall can be found naturally just about everywhere. Grab a few pumpkins to place on your porch, gourds for your mantel and table centerpiece… even corn stalks can be beautiful with a little imagination! Color pop – Gold, amber, red, brown…It’s a great idea to invest in fall-colored accent pieces, like throw pillows, rugs, blankets and even window coverings. Store them in the off-season and pull them out in September for cozy fall style you can keep well into winter. Flower power – Most people think spring and summer are the seasons for flowers, but the fall can also offer glorious buds and blossoms. Chrysanthemums, calla lilies and Peruvian lilies are only some of the in-season flowers. Plan ahead to have them blooming in your own garden come summer’s end, or purchase a seasonal bouquet to show off. Candle clusters – Nothing says fall quite like a warm, golden glow. Fill a flat round bowl with short candles and create a centerpiece on your kitchen table, line your window sills or mantels with votives and enjoy a fiery glow all season—but make sure to practice adequate fire safety, of course!